Please note the current NuGet realease might require a different version of the FFmpeg binaries than the ones of the current state of the source code. Here is a quick guide on how to get started. Open Visual Studio (v2017 or v2019 recommended), and create a new WPF Application. Target Framework must be 4.6.1 or above. You need FFmpeg shared binaries (64 or 32 bit, depending on your app's target architecture). Build your own or download a compatible build from Zeranoe FFmpeg Builds site. Within you application's startup code (Main method), set Unosquare.FFME.MediaElement.FFmpegDirectory = @"c:\ffmpeg";. To play files or streams, simply set the Source property: Media.Source = new Uri(@"c:\your-file-here");. Since Source is a dependency property, it need to be set from the GUI thread. Note: To build your own FFmpeg binaries, I recommend the Media Autobuild Suite but please don't ask for help on it here. FFME is a close (and I'd like to think better) drop-in replacement for Microsoft's WPF MediaElement Control. While the standard MediaElement uses DirectX (DirectShow) for media playback, FFME uses FFmpeg to read and decode audio and video. This means that for those of you who want to support stuff like HLS playback, or just don't want to go through the hassle of installing codecs on client machines, using FFME might just be the answer. Properties such as Position, Balance, SpeedRatio, IsMuted, and Volume are all Dependency Properties! Additional and extended media events. Extracting (and modifying) video, audio and subtitle frames is very easy. Ability to easily apply FFmpeg video and audio filtergraphs. Ability to extract media metadata and tech specs of a media stream (title, album, bit rate, codecs, FPS, etc). Ability to apply volume, balance and speed ratio to media playback. MediaState actually works on this control. The standard WPF MediaElement severely lacks in this area. Ability to pick media streams contained in a file or a URL. Ability to pass input and codec parameters. Ability to introduce hardware decoding acceleration via devices or via codecs. If you'd like audio to not change pitch while changing the SpeedRatio property, you'll need the SoundTouch.dll library available on the same directory as your application. You can get the SoundTouch library here. First off, let's review a few concepts. A packet is a group of bytes read from the input. All packets are of a specific MediaType (Audio, Video, Subtitle, Data), and contain some timing information and most importantly compressed data. Packets are sent to a Codec and in turn, the codec produces Frames. Please note that producing 1 frame does not always take exactly 1 packet. A packet may contain many frames but also a frame may require several packets for the decoder to build it. Frames will contain timing informattion and the raw, uncompressed data. Now, you may think you can use frames and show pixels on the screen or send samples to the sound card. We are close, but we still need to do some additional processing. Turns out different Codecs will produce different uncompressed data formats. For example, some video codecs will output pixel data in ARGB, some others in RGB, and some other in YUV420. Therefore, we will need to Convert these frames into something all hardware can use natively. I call these converted frames, MediaBlocks. These MediaBlocks will contain uncompressed data in standard Audio and Video formats that all hardware is able to receive. We call Open to open the input stream and detect the different stream components. This also determines the codecs to use. We call Decode to read the following packet from the queue that each of the components hold, and return a set of frames. Finally, we call Convert to turn a given frame into a MediaBlock. The MediaEngine wraps a MediaContainer and it is responsible for executing commands to control the input stream (Play, Pause, Stop, Seek, etc.) while keeping keeping 3 background workers. The PacketReadingWroker is designed to continuously read packets from the MediaContainer. It will read packets when it needs them and it will pause if it does not need them. This is determined by how much data is in the cache. It will try to keep approximately 1 second of media packets at all times. The FrameDecodingWroker gets the packets that the PacketReadingWorker writes and decodes them into frames. It then converts those frames into blocks and writes them to a MediaBlockBuffer. This block buffer can then be read by something else (the following worker described here) so its contents can be rendered. Finally, the BlockRenderingWorker reads blocks form the MediaBlockBuffers and sends those blocks to a plat-from specific IMediaRenderer. At the highest level, we have a MediaElement. 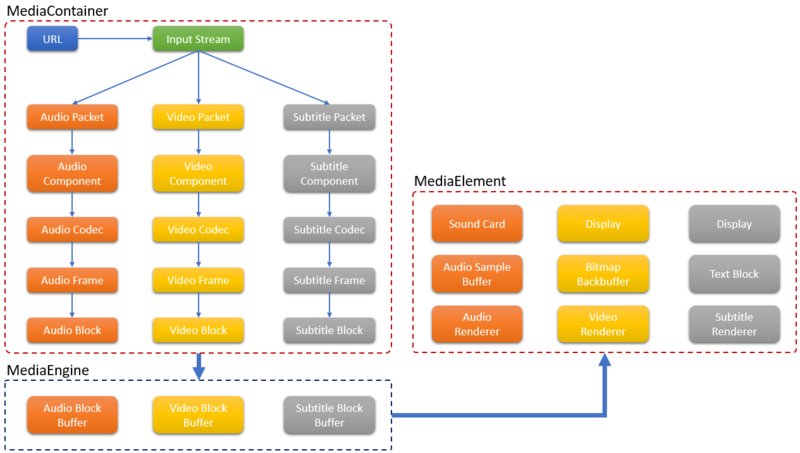 It wraps a MediaEngine and it contains platform-specific implementation of methods to perform stuff like audio rendering, video rendering, subtitle rendering, and property synchronization between the MediaEngine and itself. A high-level diagram is provided as additional reference below. I am planning the next version of this control, Floyd. See the Issues section. Please note that I am unable to distribute FFmpeg's binaries because I don't know if I am allowed to do so. Follow the instructions below to compile, run and test FFME. Download the FFmpeg win32-shared binaries from Zeranoe FFmpeg Builds. Extract the contents of the zip file you just downloaded and go to the bin folder that got extracted. You should see 3 exe files and multiple dll files. Select and copy all of them. Under the Unosquare.FFME.Windows.Sample project, find the file App.xaml.cs and under the constructor, locate the line MediaElement.FFmpegDirectory = @"c:\ffmpeg"; and replace the path so that it points to the folder where you extracted your FFmpeg binaries (dll files). Click on Start to run the project. You should see a sample media player. Click on the Open icon located at the bottom right and enter a URL or path to a media file. The file or URL should play immediately, and all the properties should display to the right of the media display by clicking on the Info icon. You can use the resulting compiled assemblies in your project without further dependencies. Look for both ffme.common.dll and ffme.win.dll. If you get the following error when compiling: The current .NET SDK does not support targeting .NET Standard 2.0. Either target .NET Standard 1.6 or lower, or use a version of the .NET SDK that supports .NET Standard 2.0. Simply download and install .NET Core SDK v2 or later. Note: when building FFmpeg locally, compiled libraries are named differently than in the list above. E.g. libavcodec.57.dylib is actually named libavcodec.57.89.100.dylib. To properly load libraries, copy and rename each library to match the format in the list above. Note that this can be customized to point to any other folder. When distributing the player and the associated libraries with your application, dll files should be added to the project as BundleResource items. Also, each library should be copied to the output directory on build. Afterwards, change the above configuration to use Environment.CurrentDirectory to search for FFmpeg libraries. Make sure you have Xamarin for Visual Studio 2017 installed if you want to open the MacOS projects. To the FFmpeg team for making the Swiss Army Knife of media. I encourage you to donate to them. To Kyle Schwarz for creating and making Zeranoe FFmpeg builds available to everyone. To the NAudio team for making the best audio library out there for .NET -- one day I will contribute some improvements I have noticed they need. To Ruslan Balanukhin for his FFmpeg interop bindings generator tool: FFmpeg.AutoGen. To Martin Bohme for his tutorial on creating a video player with FFmpeg. Please refer to the LICENSE file for more information.